Nine has confirmed a fourth season for House Husbands for 2015. It follows the shows format getting picked up by European production companies. 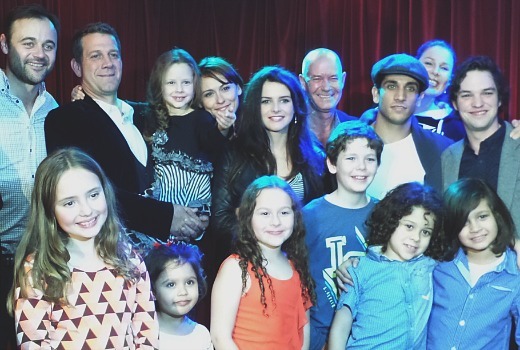 Returning to the series are Gary Sweet (Lewis), Firass Dirani (Justin), Gyton Grantley (Kane), Rhys Muldoon (Mark), Julia Morris (Gemma) and Natalie Saleeba (Abi) -there is no mention of Anna McGahan, despite an upcoming proposal for her character in the current season, nor Rachel Griffiths. Nine’s co-Heads of Drama, Jo Rooney and Andy Ryan, said: “Life will get even more unpredictable and entertaining for our House Husbands and their families in 2015. Playmaker’s series has been sold to Made In PM in France and Publispei in Italy which plan will use scripts from the first season as the basis for remakes, should they be sold to a broadcaster. Nine’s press release indicates “the current season of House Husbands will resume on Monday, August 4, at 8.30pm following The Block Glasshouse” but EPGs indicate it is scheduled for 8:40pm. Hopefully Tim Campbells character will make a return in the new series. It’s a bit unrealistic that he would want to totally miss seeing his neice grow up. Good on 9 for renewing it, but if can ink of other shows I enjoyed more that didn’t last 2 season. As much as some hated it, Rescue Special Ops rated better and I found them more likeable. I feel eh renewed it since they didn’t have anything else in the pipeline. Let’s hope they make Rhys Muldoon’s character and family a bit less annoying. The helicopter parenting of that woman drives me insane ! well at least one network backs aussie drama in. Yes good news. Strategically announced after 51% of 2013 drama was from NZ. Drama series suffer from the law of diminishing audiences with each season – unless the writing is truly excellent such as Rake and Offspring. The ratings for this series of HH have been as lacklustre as they deserve. This renewal feels like lazy programming from Michael Healy – Nine should be looking for at least one new Australian drama series each year. More HH and half the drama quota filled with NZ is just not good enough to win the audience Nine wants. Note to DG:Must try harder. Wasn’t expecting a renewal so soon, considering how disappointing the ratings have been this season. I reckon Nine is hoping that the early renewal/positive publicity for the show will help lift ratings. Hope Rachel Griffiths’ character returns in the future, I’ve really enjoyed her storylines. the writing on this previous season has been really weak. I feel like they got told they were renewed and then had to write a season full of scripts in a short period of time because they just ignore a main character that Tim Campbell played like he just suddenly leaves with no explination. They bring in Rachel Griffiths for some drama and so unconvincingly gets Gary Sweet to cheat with her and made up a long lost son. thats the stuff of soaps. They also had 2 separate incidents of taking the wrong kid and not even realizing. This is one show that lacks something….maybe some consistent acting that appears not to be fake or pushed.Series one just cut it,cut the other two,nope. The guy playing Justin has moved to NY & Rachelle Griffiths I think will not return,which is not a bad thing. For someone that has worked in hollywood for a long time…well, you could have fooled me….only saved by the delightful Julia Morris. Ran out of the little steam it originally had ages ago. Should have put HH out to pasture 2 seasons ago instead of trundling it out indefinitely. I’m sure the European shows will do their own thing after season one because in Australia it went off the track in season two and completely derailed in season three. Great news! I love this show! The big question is will it be on Sundays or Mondays in 2015? Or how about put it on twice a week…say Sunday and Monday – that way you won’t miss it! !